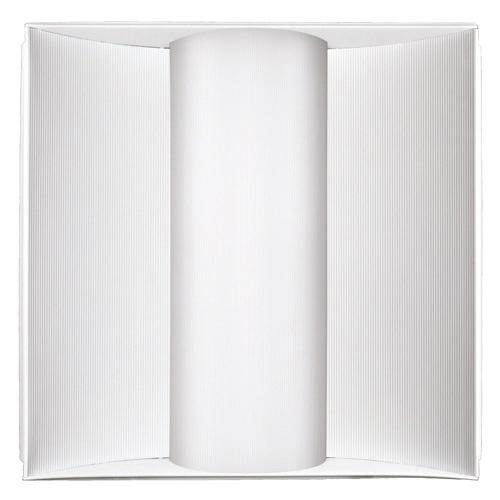 Lithonia Lighting VT Series 2VTL Collection Static air function volumetric LED troffer in gloss white finish, features cold-rolled steel coated polyester construction. This LED troffer in rectangular shape, uses 30.76-Watt LED that has voltage rating of 120 - 277-Volts. Lamp in the LED troffer has color rendering index of 82 and color temperature rating of 3500K to ensure optimal light level in the surrounding. LED Lamp offers 3000-Lumens of bright light output. It measures 48-Inch x 24-Inch x 4-3/8-Inch. Recessed mountable LED troffer comes with 60000 hours of average life span. LEDs Coupled with high-efficiency drivers provide superior quantity and quality of illumination. Acrylic linear prismatic diffuser of this troffer creates soft light to the surrounding. It is ideal for offices, schools, retail locations and hospitals. LED Troffer is IC rated, CSA and DLC certified.